Sure, there are many fun and exciting ways to explore Central Idaho’s incredible landscapes, but few rivals a pulse-pounding ride through the whitewater rapids of the Salmon River. You get a front row seat for viewing the breathtaking Sawtooth Mountain wilderness as you fly down the deep blue water accented by sections of chaotic whitewater. If you’re searching for a company to take you down the river, check out White Otter Outdoor Adventures! Their team of experts will ensure that you have a memorable and safe journey through some of the most picturesque areas you’ll ever visit! Want more ideas for outdoor adventures near Stanley, ID? Request our free Adventure Guide for rafting trips, hiking trails, fishing opportunities, and much more! Guided river trips are the main specialty at White Otter Outdoor Adventures, and they have several different experiences that you can choose from. The classic Half Day River Rafting Trip features Class II and Class III rapids, which is a medium difficulty whitewater experience that everyone in the family can participate in and enjoy. You can also add lunch or dinner to this trip. For those searching for pure adrenaline-pumping action, try their Thrill Seekers Rafting Trip. A White Otter Outdoor Adventures guide will navigate you through Class IV rapids through several difficult but fun whitewater sections such as “Shotgun” and “The Dam”. You must be 14 years or older to for this trip, so make sure you’re prepared for some rip roarin’ whitewater fun before you sign up! White Otter Outdoor Adventures also offers customized trips for big groups. A Scenic River Float is the perfect way for the whole family to take in the beautiful outdoors as you go for a relaxing ride down the Salmon River. You’ll experience the crystal clear river while viewing some Central Idaho wildlife, and maybe even slashing around in the water for a little bit! The Salmon River has its name for a reason. The fast-flowing waters are home to some of the best salmon fishing in the country. White Otter Adventures gives you the chance to cast your line in while floating down the river where you’ll have the opportunity to catch chinook and steelhead salmon in addition to a variety of trout. Your guide will provide you with rods, lunches, and other necessary fishing equipment for a day on the water. 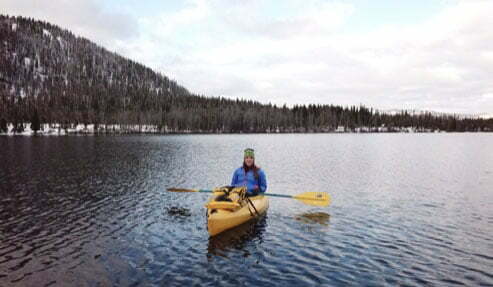 Tip: White Otter Outdoor Adventures is about a 20-minute drive north of Stanley in Sunbeam. Follow ID State Highway 75 all the way from Triangle C Cabins along the Salmon River until you see it on your left! Let Your Inner Adventurer Out at Triangle C Cabins! Spend your days discovering and exploring the incredible nature surrounding Stanley and spend your nights resting in a Triangle C Cabins rental! 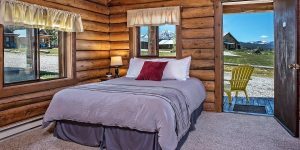 Each one of our cabins provides you with an authentic and rustic mountain stay. They are the perfect place to disconnect from the outside world and become one with nature. 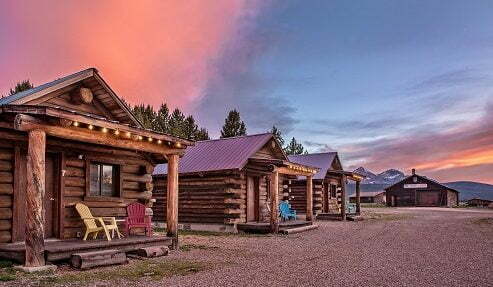 Step outside of your cabin to and gaze around at the towering Sawtooth Mountains that are beckoning you to explore them! Speaking of exploring…our Adventure Bundles give you the keys to getting out and experiencing the best biking, hiking, and boating opportunities in the area! We do all of the work preparing your journey for you. All you have to do is get out and enjoy yourself! Come experience this unique and beautiful part of the country for yourself! Don’t just take our word for it! Check out our cabins and book your adventure today! We can’t wait to meet you!